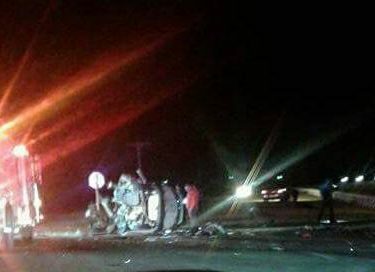 Two people were killed Tuesday evening in a crash on U.S. 54 northeast of Liberal. The Kansas Highway Patrol stated the accident occurred at 6:20p.m. between Country Estates Road and Salley Road (County Road 7). A 2016 Freightliner semi driven by 26 year old Abdullah Muhammad of Orlando Florida was southbound on Salley Road when he failed to stop at the stop sign at the intersection with Hwy 54. The semi struck a 2014 Toyota Rav4 being driven by Jerry Dean Slykhuis, 73, of Cedar Falls Iowa, who was westbound on Hwy 54, killing Jerry Slykhuis and his passenger, Jacqueline Jane Slykhuis, 70, also of Cedar Falls Iowa. Muhammad and his passenger, Michael Renix Charles, 27, of Apopka Florida, were not injured. The highway was temporarily closed in both directions, with traffic detoured along Salley Road and U.S. Hwy 83.